Every Martin Luther King, Jr. Day, I read his “Letter from a Birmingham Jail.” I think it is one of the most important and most powerful letters ever written and every year, especially recently, I feel like it becomes more and more relevant. Please, click the above link and read the whole letter. It isn’t too long and it’s incredibly moving. 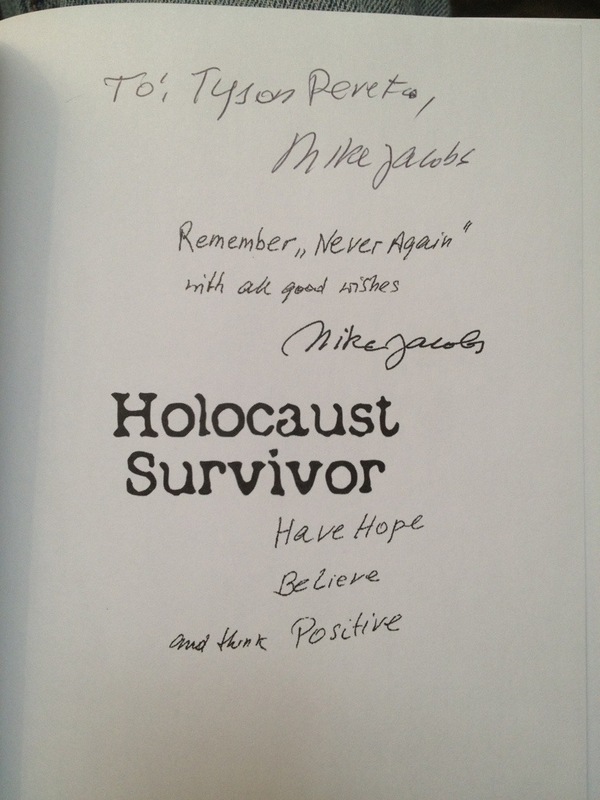 I just met a holocaust survivor. Pretty surreal. What do you say to a man who has seen so much, who has experienced such horror? What could I say? “I’m sorry” just doesn’t seem sufficient. I wanted to express my sense of loss. I wanted to let him know that I’ll never forget what happened. That I’ll do everything in my power to stop discrimination, injustice, and genocide. But all I did was thank him for the book. I just couldn’t say more.